This is the fifth time around for the acclaimed works by Lorraine Hansberry. The first time was the Broadway version. Then there is the classic 1961 version performed by Sidney Poitier, Ruby Dee, Diana Sands, Claudia McNeil, and Ivan Dixon. The third time Esther Rolle took on the role as “Mama”, with Danny Glover, Starletta DuPois, Helen Martin, and Joseph C. Phillips rounding out the cast. In 2004 there was a Broadway run with the current cast, which consist of Phylicia Rashad in the role as the matriarch of the family, Sean “Puffy” Combs as “Walter Lee Younger”, Audra McDonald as “Ruth Younger”, and Sanaa Latham as “Beneatha Younger”. These folks will be reprising their roles tomorrow night. I must say that I am looking forward to this televised version of the play and I am glad this is being shown February 25, 2008 during African American History month. I have compiled some fact about the play and the playwright. 1. Lorraine Hansberry, the writer of the play, succumbed to cancer at the age of thirty-four. 2. The original “Beneatha Younger”, Diana Sands also passed away of cancer at the age of age of 39 while making the film “Claudine” in which she was the lead. She was replaced by Diahann Carroll. 3. A theatre in Wisconsin, the Hansberry-Sands Theatre, was so named in tribute to them both. 4. The major conflict in the story is the Youngers, a working-class black family, struggle against economic hardship and racial prejudice. 5. The theme of the play is the value and purpose of dreams, the need to fight racial discrimination, the importance of family. 6. The rising action is Ruth discovering that she is pregnant; Mama making a down payment on a house and giving Walter the remaining insurance money; Walter investing the money in the liquor store venture. 7. The falling action is Walter refusing Mr. Lindner’s offer to not move; the Youngers moving out of the apartment to their new house in the white neighborhood; Beneatha finding new strength in Asagai. I know that Phylicia Rashaad, Sanaa Latham, and Audra McDonald are up for the challenge. I am concerned about Sean Combs because Sidney Poitier's shoes are very difficult to fill. The show airs Monday, February 25th at 8:00 EST. Please check out the trailer for the film and ignore the first minute, which consist of Sean Combs rambling. Thanks for posting this reminder. 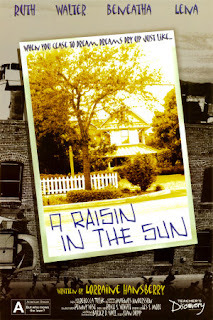 A Raisin In The Sun is one of my all time favorites. I LOVE the original, but I was kind of blah on the last remake. Even so, I'm looking forward to this version. While Mr. Combs is certainly no Tupac, who really did have some acting chops, he just might be able to pull off a decent "Walter Lee." I'm willing to give him a chance anyway.(smile). But hey, next time you might just want to post a "spoiler" alert. Of course, most of old heads know the ending, but some the young newbies just might not see it (your #7) coming (smile). Point taken about the spoiler. I just assume that everyone has seen this work in some form, at least everyone who reads my blog anyway. You didn't like the Danny Glover/Esther Rolle version? Interesting. Thanks for posting about this. I didn't know about the Hansberry/Sands Theatre. What a cool tribute to those two women. After reading your post, I remembered the musical version of the play produced in the 70s called "Raisin". I wonder if they ever filmed any of the stage performances because I would love to see it. The cast included Joe Morton (Walter Lee), Debbie Allen (Beneatha), and Ralph Carter (Travis). You may remember the closing credits of the early episodes of "Good Times" when it said something like "Ralph Carter courtesy of Raisin". Until yesterday, I didn't know that they did a revival of the musical version a few years ago. Did you catch the show. If so, what did you think? Any performances stand out to you? Malcolm, Oh Yeah! I forgot all about Raisin, but I do remember now. Ralph Carter's involvement in the play is what made the producers of "Good Times" take notice. Lori, not yet. I had a class last night and by the time I got home it had already started and I wanted to see it from the beginning. I did tivo it so I will try to see it today or tomorrow. In any event I will definitely let you know what I think so check back.